In the next two years, Metro is currently working on a technologically advanced and easy-to-use electronic Smart Card fare system. A new computer system will be installed to make this exciting Smart Card system work. As part this project, Metro will either retrofit or replace its aging and outdated fareboxes and ticket vending machines, which are getting harder and more expensive to maintain. Metro received a special federal grant just to do this project. Metro’s project partner is Madison County Transit, which has assisted with the project study and evaluation and may also implement the new system. This project is still in development and won’t be in effect for two years, so there are a lot of policy decisions and practical decisions that still need to be made. But we’re so excited about it that we’re going to go share the possibilities that the technology will bring. As the decisions are made later, we’ll keep you updated on how the system will actually work here in St. Louis. A ticket vending machine with a Smart Card interface. What is a Smart Card, and how does it work? Smart Cards carry tiny electronic circuits that will keep track of how much value they have on them and what trips you’ve taken that day. They can be loaded with value (i.e. dollar amounts), used until the value is all used up, and then reloaded again. Users “tap” their Smart Cards on the farebox or validator, which responds with a light and an audible alert to indicate the fare is accepted. How will I add value to my Smart Card? 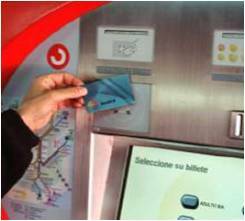 The ticket vending machines will be updated so that they can reload value on Smart Cards. Many Smart Card systems also let users manage their accounts online, including adding value. When will this be ready for me to use? We hope to have the test system in place and running by the early 2012. A test system maybe in place by next year. It will take that long to design a system that works for riders, develop the software, network the vending machines and validators into our system (which will involve work like tearing up concrete at stations to put in electrical connections, etc. ), and make all of the policy decisions that need to be made so that the new system functions smoothly and fits the needs for St. Louis. How will this help the “free rider” problem? Metro actually has two “free rider” problems. One is actual fare evaders; the other is the public perception that Metro has a bigger “free rider” problem than it really does. In truth, our own studies show a very low fare-evasion rate compared to other systems in the industry. But because monthly passholders don’t buy tickets and are frequently recognized by the security guards and fare checkers as they board the same bus or enter the same MetroLink station every day, many people riding our system perceive that their fares are not checked and they are riding for free. With a Smart Card system, though, everyone will “tap” their cards on the farebox or validator as they enter the bus or a MetroLink station. The farebox or validator will make a noise and flash a light, so everyone watching will know that the person “paid” their fare as they entered. (And if someone doesn’t tap, everyone on the platform also would know!) If eventually Metro should go to a barrier system (either physical or virtual), the Smart Cards can be used for that, too. There will still be fare checkers who will carry handheld validators that can tell if you “tapped” your card and issue citations if they find violators. Please take into consideration those of us who bring our bikes on-board. There are quite a few of us who use Metrolink daily, but need a bike to finish/start our commute. That’s one of the nice things about using smart cards – no worries about money jamming in a farebox. Our ticket vending machines are already time-tested and proven here. But new technology will bring new challenges, I’m sure. Good advice in general nonetheless – thanks, Jimmy! TVM’s work well with light rail and a finite number of stations. Unless Metro plans to deploy TVM’s at EVERY ONE of its thousands and thousands of bus stops, either the buses will need to accept cash or Metro will need to deny boarding to customers who aren’t smart enough to use smart cards, or are simply just too poor (Pittsburgh’s problem). Excellent news! I’m sure there are many ways to make the new system bike friendly, but it is important for Metro to look at that NOW, instead of needing to retrofit after the fact. I’m pretty sure that Chicago’s buses accept fare cards and cash, and that system seems to work pretty smoothly. Jimmy, I’ve used smart cards in dozens of cities. If you don’t have a card, or if your card has no money on it, you can always use cash. Buses can accomodate more than one payment system. 1. If we’re tapping our cards when we get on and when we get off, then please put two card readers by the back door to avoid people lining up to tap their cards and taking forever to get off the bus. 2. As quickly as possible move this system into parking meters, library fines, and all manner of other money-moving systems in the city. The wider the card is applied, the greater the public awareness, and the greater acceptance. It’s easier to pay for parking and library fines with a smart card anyway. 3. Get it on MCT and the Loop Trolley please. As I said in the post, Daron, Madison County is on board with this project but it’s up to them whether they ultimately decide to implement it. You may want to drop them a line and let them know how you feel, if you feel strongly. I love the idea of using the same method of payment for other items, too. Then again, I think it won’t be too awful long before we’re using our cell phones as our payment methods, and then it won’t matter. Don’t get me wrong, I’m not opposed to the concept or the program. I’ve just seen too many examples of over-promised and under-delivered, especially in the public sector, to be leery of any wholesale change in technology. Rolling this out incrementally, on a handful of routes out of one garage, would allow Metro and the vendor to debug any problems that Murphy’s Law says WILL inevitably occur . . .
For those who use Call-a-Ride, will these be good on Call-a-Ride? It would be nice if they are good on Call-a-Ride. That is because lots of people ride it. And if someone plans to visit St. Louis, can smartcards be sent in the mail? I like the new fareboxes! The ones we have now have been trouble a times. Once we get these, we need to be downright strict on the cleanliness on them so that they will last longer and work properly too! Right, a ‘smart card’ is just a chip. You can put the chip in a phone, a pencil, or even implant it in the palm of your hand. Right now, in Seoul, I can use my cellphone instead of a smart card if I want. The money is charged to my phone bill. I can also use a credit card. All of them can just be waved at the reader. The difference being that if I lose the card, I can get a new one, but if I lose my phone or credit card I have to get them cancelled and replaced quickly. I’m really quite skeptical about this new system, given that it is a response to a perceived problem (widespread fare evasion that is not in fact taking place) rather than to a real problem. It seems very expensive to implement. It would be useful for us blog readers to see a cost-benefit analysis. Actually, it’s in response to a cash-handling problem. Cash needs to be counted and handled securely, and customers need to carry exact change. Fare boxes work well with coins, not so well with bills. And it’s quicker to wave or slide one card than it is to deposit a mix of bills and coins. Patrick: Yes, the Smart Cards will be usable for Call A Ride. We will switch out the IDs so that they are IDs with Smart Cards built in. Phil: The system isn’t being implemented in response to a perceived fare evasion problem at all. That’s just a side benefit of having the audible/visible “tap signal” as people enter & leave MetroLink stations. 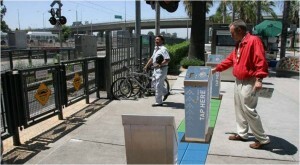 This project was conceived because Metro’s fareboxes need to be replaced. The biggest portion of this project is replacing those fareboxes. While we were at it, we decided to implement a new fare collection system because of all of the benefits it will provide to customers. The agency will benefit too, in the ways I outlined in the post (like reducing cash-handling expenses); but really this is about adding a significant customer benefit to a project that needed to be done anyway. As for the expense of implementing, as I said, Metro has to replace the fareboxes anyway. The TVMs that haven’t been upgraded needed upgrading anyway. What’s more, this project is funded by a special federal grant (an earmark) that is only good for this project. If we weren’t doing the project, we wouldn’t have gotten the funds. The money being used on the project isn’t coming from Operations and couldn’t be used for any other capital project. Don’t worry, Jimmy Z, as I mentioned in the post, there will be a test system in place that will thoroughly work out the kinks before it’s deployed system-wide. Frankly, I find this proposal to be disturbing. As if the TSA agents and cops crawling all over the place doesn’t provide an oppressive enough environment, this smart card crap certainly will put the icing on the cake. Why doesn’t Metro start using Houston as a role model and just have law enforcement do random bag checks and pat-downs, too? These smart cards can and will be used to track riders, if not for Metro’s own purposes, then in the name of “anti-terrorism.” Furthermore, these cards most likely will contain RFID chips that, once you get off the bus and/or train, will be read by the card reader and stored. But they won’t tell you that. I don’t appreciate the fact that Metro would have that ability. It’s none of anyone’s business where people are going.